How does a slow cooker and Crock Pot actually work? The method of slow cooking has been around for centuries and used either moist or dry heat. Both methods use a container of some sort to let the food cook slowly. Pig roasts and barbeque pits are a great example of using slow cooking with moisture. Since the condensation has no where to go, it seals in and preserves the flavors of the food. Dry heat slow cooking is basically oven roasting. The major downside to this is that the liquid condensates as the steam is released during cooking. Slow cookers become very popular during the seventies. Soon microwaves came into style a few years later. Slow cooker manufacturers fought back by developing more stylish and convenient features. A revival has taken place over the last decade. 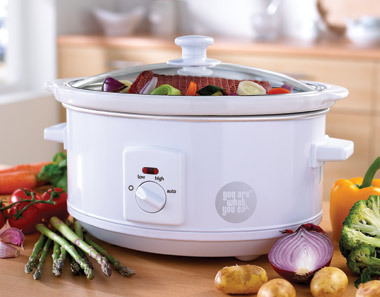 Everyone wants healthier meals prepared in less time and slow cookers are ideal for that. Slow cookers today are composed of a shell and a liner. The shell contains the heating coils that completely surrounds the liner but never actually make direct contact with the liner. The liner slips inside of the shell and is the part that holds the food for cooking. Depending on the brand of slow cooker the liner can be made of different materials. It can either be steel enamel, non stick steel or crockery. The difference is that the steel liners are more energy efficient and crockery provides more even heat. All slow cookers have transparent lids made of either heavy glass or plastic. Unlike the older models, nowadays you can regulate the food much easier and at a constant heat. Now all slow cookers today have dial controls on the front. These usually include off, low, high, and some also have keep warm or auto settings. The slow cooker aka “one pot wonder” has been getting a huge following! As a crockpot lover myself, it’s really exciting to see the enormous variety of slow cooker recipes and cook books available these days. If you’re still on the fence about whether or not you want a slow cooker, here a list of pros and cons you might want to consider.